Do you think that the term Independent Software Vendor is still relevant? Do you think in a world of html, cloud, services and startups that the term Independent Software Vendor is still relevant? Recently I have been “trying out” the term “Software Product Authors” to be a little more general. P.S. This is also just some fun with polls – as I haven’t tried them out on wordpress yet. But I’m definitely interested in peoples views. With the monitoring pack you can now check on the availability and performance of your applications running on Windows Azure from System Center Operations Manager 2007 R2. The great news is there is a VHD you can download to try this all out with ease and check out the TechNet documentation. My favourite online fps series of all time is Battlefield (my favourite game of all time is Planetside – but I digress). I’m currently playing Battlefield Bad Company 2 (mainly on PC – as erknel) whilst counting down the days to the release of Battelfield 3. I’m also keeping a watching eye on how well the pre-orders are going vs Modern Warfare 3 as having been fortunate enough to be on the BF3 alpha, BF3 deserves the commercial success that would come with toppling MW3. Pre-orders on PC are tricky to find (with lots of digital ordering) – but its pretty easy to track for consoles, especially for America. Which leads me to this from http://www.vgchartz.com/preorders.php. On Xbox, MW3 is clearly winning – but a lot of Xbox users are spending their cash on the excellent Xbox exclusive Gears of War 3. With that in mind I think BF3 is doing great – post GOW3 it will be interesting to see how the the weekly change compares between the two games. 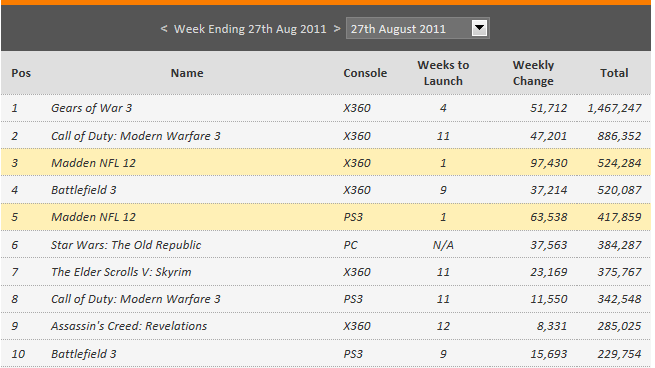 On PS3, BF3 now has a significantly higher weekly change than MW3 – 4000 more! These monthly workshops on the Windows Azure Platform are designed to help Microsoft partners who are developing software products and services and would like to explore the relevance and opportunities presented by the Windows Azure Platform for Cloud Computing. The workshops are designed to help partners such as yourself understand what the Windows Azure Platform is, how it is being used today, what resources are available and to drill into the individual technologies such as SQL Azure and Windows Azure. The intention is to ensure you leave with a good understanding of if, why, when and how you would take advantage of this exciting technology plus answers to all (or at least most!) of your questions. These workshops are aimed at technical decision makers including CTOs, Technical Directors, senior architects and developers. Attendees should be from companies who create software products or software services used by other organisations. For example Independent Software Vendors. There are a maximum of 12 spaces per workshop and one space per partner (we can waitlist additional employees). This format is designed to encourage discussion and feedback and ensure you get any questions you have about the Windows Azure platform answered. Just what is the Windows Azure platform? Whist reading through Architecture of Tankster– Scale (Part 2) I noted that Nathan had looked at some of the performance and size limitations of the Windows Azure Platform and how they would impact the architecture of the solution. I have previously pointed at this post by the team from May 2010 which digs into Azure Storage in detail and includes details on limits etc. Bandwidth: Up to 60 megabytes per second.